"This cookie is like a fudge-filled shortbread." In a medium bowl, stir together the flour and salt. Cut in the butter with a pastry cutter or fork until only small lumps remain. Sprinkle the water and 1 teaspoon vanilla over the mixture and mix well using a fork. Set aside. In a small bowl, mix together 1/4 cup butter, egg yolk and sugar until smooth. Beat in 1 teaspoon vanilla, cocoa and coconut until smooth. Set aside. Use 1/2 of the dough at a time. On a cloth covered board, dusted generously with sugar, roll dough out to 1/16 inch thick. Cut the dough into 2 1/2 inch squares. 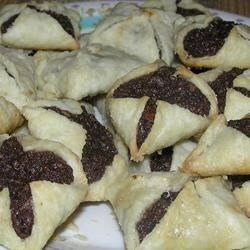 Spread 1 teaspoon of filling onto each square, bring the corners to the center and press lightly to seal. Place them onto an ungreased cookie sheet about 2 inches apart. Bake for 15 to 20 minutes, or until edges are golden. Cool for a few minutes on the cookie sheets before removing to wire racks to cool completely. This is very similar to a recipe I made as a young teen with my cousin. Everytime we got together we made these and ate our fill, laughing and having the best time. They are really easy. These were delicious! It did take some time putting them together. I am sure that they will become breeze to make after a few more batches! really easy! I enjoyed them, and next time will add a little sugar to the shortbread for a sweeter taste. I made only the filling part to use with the Working Moms Hamentashen recipe. It made enough for approximately half a batch and worked out perfectly!